Sen. Bernie Sanders speaking in Madison, Wis., earlier this month. Updated at 9:19 p.m., with more details on Sanders' spending. Sen. Bernie Sanders (I-Vt.) raised $13.7 million in his first two months as a presidential candidate, according to a 10,047-page report his campaign filed Wednesday with the Federal Election Commission. In that time, he spent $3.1 million building a national political apparatus. 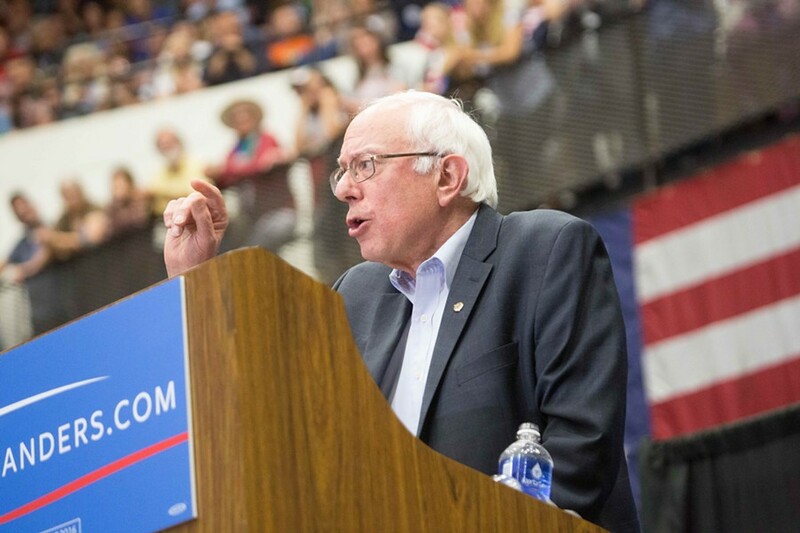 Earlier this month — and again Wednesday — Sanders' presidential campaign asserted that it raised more than $15 million. But that includes $1.5 million he had previously collected for his Senate reelection campaign and transferred to his presidential account June 30. Sanders reported having $12.2 million remaining in the bank at the end of June. More than three-quarters of the new money Sanders raised — roughly $10.5 million — came in donations of $200 or less, according to the FEC report. Sanders' campaign said it received 390,730 donations averaging $35.18. “Our campaign is a strong grassroots movement supported by middle-class Americans from working families, not billionaires trying to buy elections,” Sanders said in a written statement. Excluding money raised by super PACs affiliated with presidential contenders, Sanders raised more in the second quarter than any candidate other than Democrat Hillary Clinton, according to preliminary figures compiled by the New York Times. Clinton raised $45 million. But Sanders, who rails against the advent of super PACs, trails Clinton and several Republican candidates when affiliated fundraising entities were included. Former Florida governor Jeb Bush, for example, raised just $11.4 million through a traditional campaign apparatus, but raised $103 million through affiliated super PACs. $449,999 to Act Blue Technical Services for processing online contributions. Another $37,208 to Stripe.com for processing mobile payments. $478,150 for printing, mailing and postage. More than half of that — $278,000 — went to DemSign, a Texas-based print shop. But $30,219 of it went to the locally owned First Step Print Shop of Underhill. $211,024 for salary, payroll and political consulting. $63,850 to Devine Mulvey Longabaugh for video production. The firm is run by Sanders consultants Tad Devine and Mark Longabaugh. The campaign also paid the firm $16,923 for a call center. $60,000 to the Iowa Democratic Party for its voter file. Another $24,000 to NGP VAN for database services. $46,996 for travel — including airfare, hotels and car rental. $30,567 to Atomic Professional Audio of Rutland for equipment rental and labor associated with Sanders’ campaign launch at Burlington’s Waterfront Park. $10,800 to rent the Alliant Energy Center in Madison, Wis., for a campaign rally. $822.46 for ice cream at Sanders’ campaign launch. Ben & Jerry’s founders Ben Cohen and Jerry Greenfield split the bill for the ice cream and each contributed another $1,000 to the campaign.